Before Rosa Parks and the March on Washington, four African American women risked their careers and freedom to defy the United States Army over segregation. Women Army Corps (WAC) privates Mary Green, Anna Morrison, Johnnie Murphy, and Alice Young enlisted to serve their country, improve their lives, and claim the privileges of citizenship long denied them. Promised a chance at training and skilled positions, they saw white WACs assigned to those better jobs and found themselves relegated to work as orderlies. 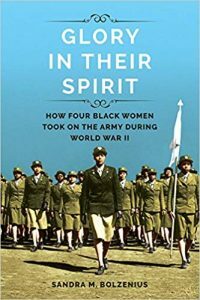 In 1945, their strike alongside fifty other WACs captured the nation’s attention and ignited passionate debates on racism, women in the military, and patriotism. Glory in Their Spirit presents the powerful story of their persistence and the public uproar that ensued. Newspapers chose sides. Civil rights activists coalesced to wield a new power. The military, meanwhile, found itself increasingly unable to justify its policies. In the end, Green, Morrison, Murphy, and Young chose court-martial over a return to menial duties. But their courage pushed the segregated military to the breaking point “and helped steer one of American’s most powerful institutions onto a new road toward progress and justice. Sandra M. Bolzenius is a former instructor at The Ohio State University and served as a transportation specialist in the United States Army. Getting Started with Electronics: Build Electronic Circuits!